Dale Earnhardt Jr. looked as nervous as he said he would be in anticipation of Texas Motor Speedway’s retirement gift to him. 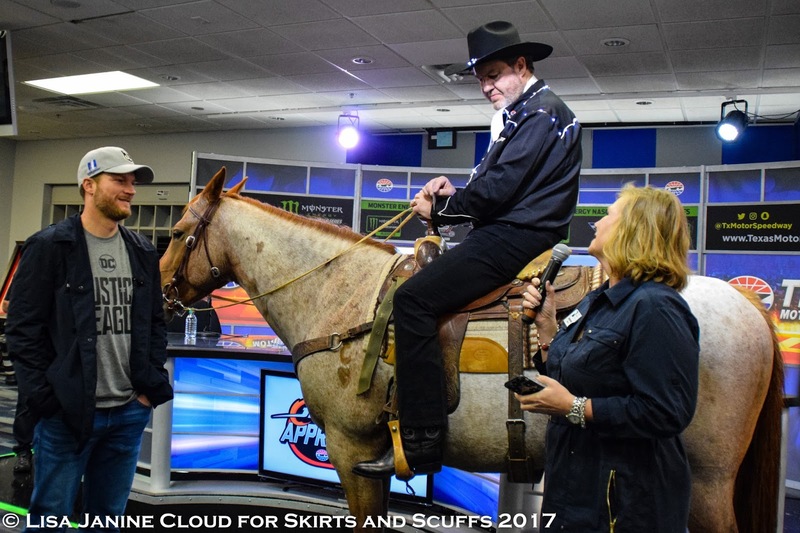 Despite his affection for the track where he earned his first wins in both the Xfinity and the Cup series, and his growing appreciation of the great state of Texas, the specter of the pair of ponies given to Jeff Gordon for his retirement loomed large. 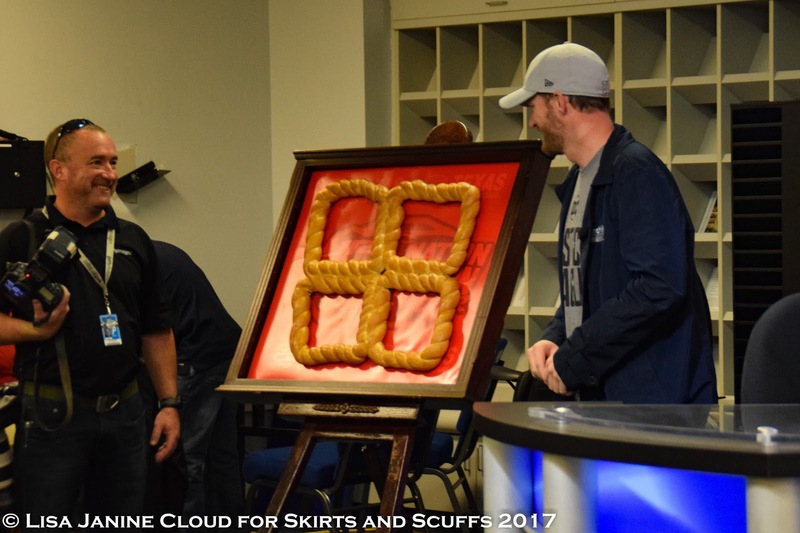 Earnhardt Jr. did fine through his regular media availability, despite being seated next to a large pair of pretzels shaped like the number 88. But during the brief wait for the media center doors to open and reveal his gift, he visibly paled. 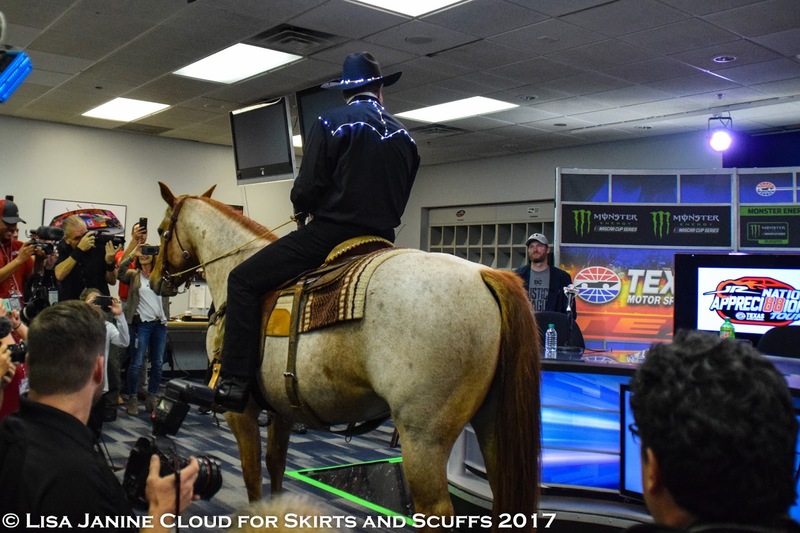 When TMS track president Eddie Gossage Jr. rode in on a roan mare he referred to as “Sarah Jessica Parker,” wearing a western shirt decorated with LED lights, Earnhardt Jr.looked like he was ready to run. Fortunately for Earnhardt Jr., SJP was not his gift. Instead, Texas Motor Speedway is sponsoring a therapy horse in his name at Victory Therapy Center, a local 501(c)(3) not-for-profit organization that provides equine-assisted therapy and psychotherapy for individuals with physical, mental, or emotional disabilities and challenges. Once he knew that he wouldn’t have to figure out what to do with a horse, Earnhardt Jr. relaxed, but only for a minute because, of course, that wasn’t the whole gift. 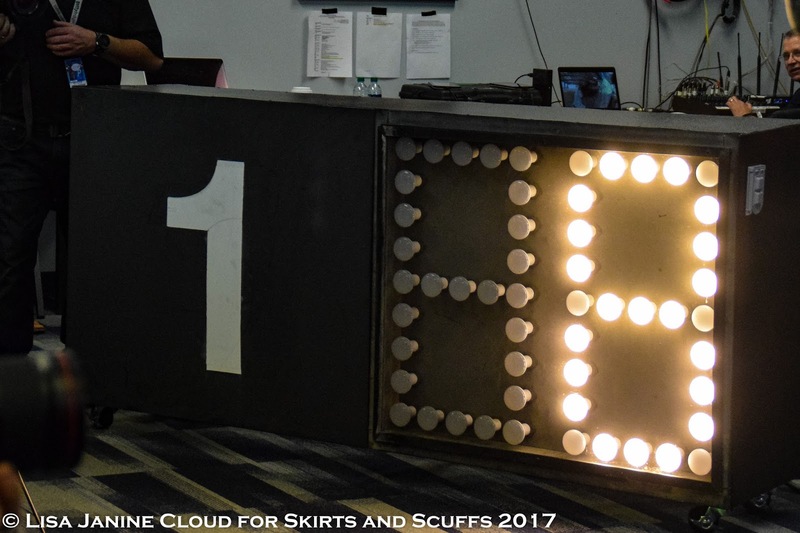 As a large, oblong item with a black cover was wheeled in, his anxiety level went back up until the cover was pulled back to reveal a section of the TMS scoreboard: the No. 1 position lit up with the No. 8 from the 2000 DirectTV 500, Earnhardt Jr.’s first NASCAR win at the Cup level. But wait - there was more. 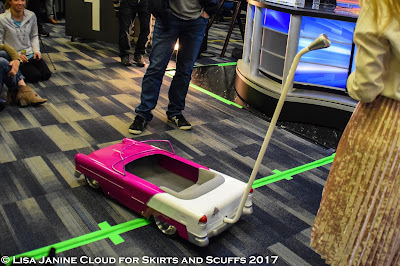 Gossage enlisted the aid of Amy Earnhardt, who pushed in a custom baby stroller shaped like a hot rod from Tot Rodz, loaded up with a gift bag of assorted TMS items. That is the cutest thing I've ever seen. I want one for my granddaughter. Her grandfather would be so proud, he loved that era.